The terms are now instantly and universally recognizable and understandable despite representing complicated concepts. The nation was largely oblivious to or just not interested in these issues before the protestors sat down in a Wall Street park and later the front lawns of City Halls, County Courthouses and State Capitals across the country. Now they are among the most pressing issues in national politics. President Obama raised the issue of income and wealth inequality in his recent 2014 State of the Union address. The New York Times Sunday Review has a standing feature, “The Great Divide,” that deals with issues of income and wealth inequality that attracts Nobel laureates as guest columnists. Republican Senator Mitch McConnell’s tax overhaul plan includes a surtax on the “1%” as he described it in interviews this week, no matter how disingenuously. The fact that CNN is even polling on the issue, let alone the findings themselves, demonstrate how effective Occupy was in making inequality an issue that demands attention and action. It may not have been by design, but somehow the scruffy kids, the pensioners, the unemployed and progressives who largely manned the Occupy sites built an effective PR machine. And while it was big demonstrations that attracted the cameras, it was the message and vocabulary that gave Occupy lasting influence. In just months, Occupy had an impact that took other great social movements years or decades to achieve. 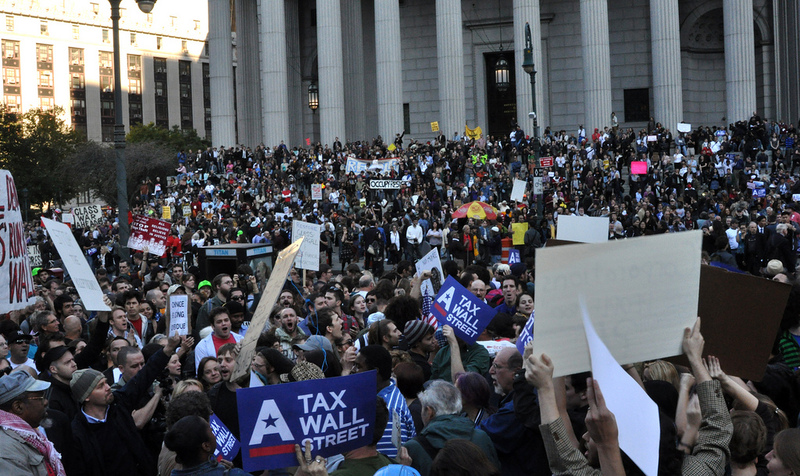 But much of the political media and talking heads largely dismissed Occupy as a failed movement. And by their antiquated measures perhaps they were right. Occupy left no permanent organization. It fielded no candidates for office. It does not have a PAC or a political party. There is no Occupy building in Washington to house dozens of bright young Ivy Leaguers, expensive consultants and unpaid interns like most of the hundreds of other advocacy groups seeking to be a bullet point on the national agenda. Of course, those are the wrong measures and they show just what’s wrong with the political media and talking heads that are seemingly paid by the decibel. It’s bad enough that they still think the Iowa Caucuses are important. In our new idea society, these trappings are irrelevant. Knowledge, awareness and engagement are what count. • Brilliant messaging: Three concepts made simple. • Powerful vocabulary: The three messages were reduced to two numbers and one word: 1%, 99%, Inequality. • Repetition: They stuck to the messaging. Relentlessly. • Passion: They honored their cause and it showed. And that’s powerful. Occupy addressed other issues as well: unemployment, the high cost of college and government corruption, providing potent speaking points in support of the three key concepts. Of course, some Occupy groups demanded things like vegan dinners and teepees for all Americans as a means to raise national consciousness and usher in world peace. Those issues didn’t fare as well. But what’s important is that the silliness of some elements of the Occupy movement did not in the end detract from the overall effectiveness of the campaign. We know that because three years later we are still talking about the 1%, the 99% and income and wealth inequality in America and what to do about it.